Director Gurinda Chada (Bend It Like Beckham) tackles one of the twentieth century's most momentous and fraught events: the 1947 withdrawl of the British from india and the subsequent handover of power, which involved the controversial partition of the sub-continent into two separate nations, India and Pakistan. That partition had disastrous and bloody consequences, immediate and long-term. The movie focuses on the man responsible for implementing the handover of power, the controversial Lord Louis Mountbatten, the last Viceroy of India. It also provides an extremely unconvincing portrait of the Viceroy's cheerfully promiscuous and rather likeable wife, Edwina. A sub-plot involves the romantic relationship between two young menbers of the Viceroy's household - one a Hindu, the other a Muslim at at time of escalating ethic tensions about to descend into horrific violence. Mountbatten, the last Viceroy of India, at the negotiating table flanked by Jawaharlal Nehru on his right and Muhammed Ali Jinnah on his left. Jinnah's ill-health (he was to die of cancer within a few months) is obvious. One of the most intriguing aspects of the frantic months before independence and partition was the relationship between Jawaharlal Nehru - leader of the Indian Congress Party- and quite a ladies' man - and Mountbatten's wife Edwina, who had an open marriage with her husband. Mountbatten himself was hardly a model of marital rectitude; his conquests included his god-daughter, fifty years younger than Mountbatten. Gossip claimed that Nehru and Edwina were lovers - probably with the knowledge and even approval of Mountbatten. Certainly the couple made little attempt in public to hide their enjoyment in each other's company, as the photo illustrates.Unfortunately, the obviously friendly relationship betwen the two only reinforced the rival Muslim League's view that the British rulers favored the mainly Hindu Congress Party. Edwina also got on well with another crucial figure in the events leading to independence and partition- Mahatma Gandhi. For decades Gandhi had campaigned for a united, independent India, urging that "peaceful resistance" would overcome British rule. But to many British politicians Gandhi was a dangerous and hypocritical fraud, irresponsibly urging policies that would exacerbate religious and sectarian hatreds. Winston Churchill, who was determined to keep India within the British Empire, declared that "I hate Indians . They are a beastly people with a beastly religion." The grandmother of the dirctor of Viceroy's House was involved in the most momentous and controversial aspect of Mountabtten's supervision of Britain's withdrawal from India - the decision to partition the vast sub-continent into India and Pakistan, two separate and separated independent states. But on fairness to Mountbatten, the proposal to partition was ultimately approved not only by the British government but also by India's two dominant political parties, the Congress Party and the Muslim League. That decision led to communal and religious violence and an incredible exodus of refugees fleeing their ancestral homes, towns and villages. At least one million were killed in horrific circumstances,thousand raped, millions were left homeless, ancient communuties fragmented or destroyed. 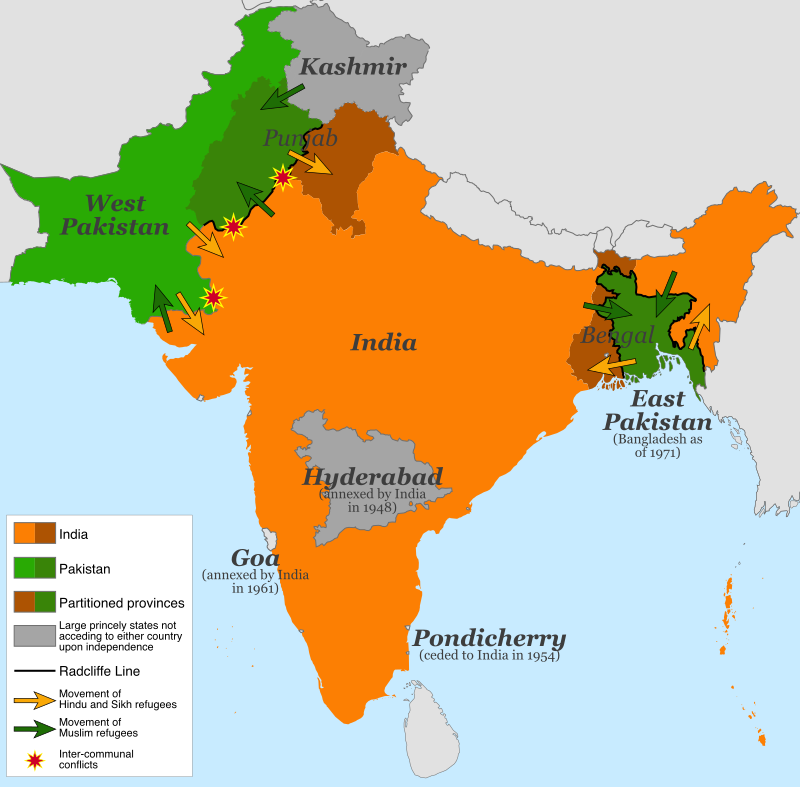 The bitterness over the partition still remains: the state of Kashmir (Muslim majority but under Indian (HIndu) control is still a focal point of antagonism that has led to armed conflcit and several wars. Refugees fleeing in the aftermath of partition. Many such trains were ambushed or derailed by mobs and their passengers raped or slaughtered in horrific scenes. 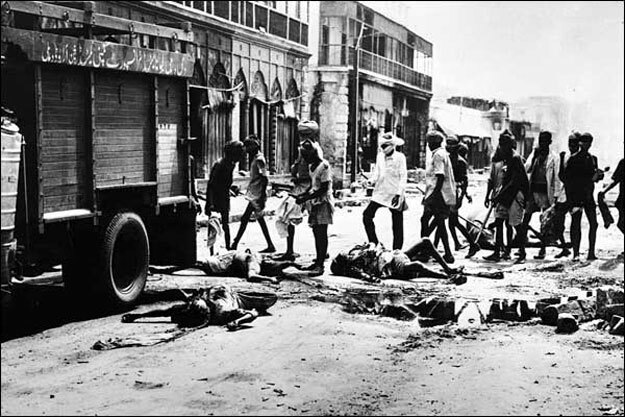 Bodies of victims of sectarian violence being cleared from an Indian street.